Footwear can be described as a basic human need and a part of clothing, but in reality for those working in this field it is not only a technique, but art and oftentimes artistry that requires specific synthetic ability and imagination from its creators. In this article we will refer to the history, the construction and the tradition of the sacred slippers of Saint Dionysios of Zakynthos. This footwear is placed in a special category of sacred Orthodox clothing that are associated with sacred relics. The morphological and aesthetic elements identified in the study of the fabric of the slippers of Saint Dionysios of Zakynthos highlight the art and similarity of slippers in the Ionian Islands from the 18th century onwards. Archbishop Dionysios, in the world known as Draganigos Sigouros, reposed on 17 December 1622, as evidenced by an official document of the time. Initially his relic was buried in the Church of Saint George in Strofades. After several years there was an exhumation, following the monastic order, and the relic was found intact. Initially the monks placed the sacred relic in the narthex of the Church of the Transfiguration of the Savior. During the 5th Venetian-Turkish war for the conquest of Crete (1645-1669), the relic was moved for better security to the Church of the Panagia of Kaliterou (a Metochion of Strofadon Monastery). After the war the monks brought the relic back to the Monastery of Strofadon. In the late 17th or early 18th century, the monks of Strofadon took action for the proclamation of the Hierarch Dionysios as a Saint. Patriarch Gabriel of Constantinople, by synodal decision, proclaimed Archbishop Dionysios Sigouros a Saint. The proclamation of Saint Dionyios as Patron of Zakynthos, instead of Panagia of Skopiotissa or Saint John the Forerunner, was made by the Community of Zakynthos after 1758 and before 1763, when the Venetian Senate approved the decision of the Intendant of Zakynthos, Francisco Manolesou, for the recognition of December 17th as the official day every year.1 Together with the other two Ionian Saints (Saint Spyridon and Saint Gerasimos) and other Saints of the Eastern Orthodox Church, bodies of the Saints that are incorrupt are dressed until today (fig. 1) with liturgical and decorative fabrics as well as with ornate slippers. Orthodox ecclesiastical fabrics are divided into three broad categories: liturgical garments, liturgical fabrics and relic textiles. To these categories there are corresponding subcategories depending on the use of fabrics in the context of worship. Liturgical fabrics (ex. antimension, epitaphios, etc.) are a subcategory of decorative fabrics, such as the lower parts of places in the sanctuary, etc. Liturgical garments, such as the priestly stole, the sakos, etc. do not have a subcategory. Relic textiles, which includes the slippers of the Saint, cover all the garments and fabrics that dress a sacred relic or cover different parts of the body as a two dimensional fabric (Karydis 2010). The honor of relics is observed already in the Old Testament and, according to Saint John of Damascus, it includes the garments of Saints, which were handed down, as Mavroska (2006) says, easier than the veneration of the Cross and icons. In the West the veneration of relics and garments, which are linked, was widespread. The reason for this is that the relic was a real “material” body of the Saint while the icon was created through the intervention of the human hand. In the Eastern Orthodox Church the veneration of sacred relics and the objects associated with them are mentioned in the recognition and honor of the martyrdom of the Saint, at the same time renewing the faithful. The Saint that is martyred for the faith becomes an instrument of God and is sanctified and there is an effort made to imitate their life. Initially, as stated by Οsborne (1985), the honor of relics are combined with the “martyrdom”, which were celebrated by the first Christians in the catacombs. The honor of sacred relics complements the Orthodox theology of the veneration of portable icons, making them an integral part in the liturgical life of the Church. The maximum dimensions of the slippers are 25 × 12 cm, and are made of short red velvet on which are sowed with gold thread and metallic yarn with a silky core as a filling decorations with floral motifs and birds. Other times the slippers are made by bending and straightening (fig. 2). The interior of the slipper is covered with white silk lining. The sole of the slipper is made of coated cardboard instead of leather or other materials as in the olden days, so the application to the relic would be better. 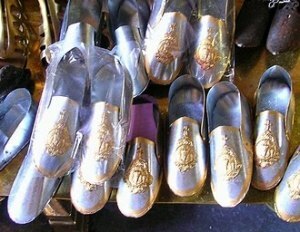 According to tradition the slippers are made by the Sacred Hermitage of the Most Holy Theotokos Eleftherotrias in Zakynthos or by a priestly store in Athens. Oral tradition shows that older slippers (fig. 3) were made of wood rather than fabric. The change of the slippers of the relic of the Saint is done usually twice a year during the two major feasts. The first in a year takes place during the feast on August 24th, which commemorates the Translation of the Sacred Relic from Strofades to Zakynthos, and the second is on December 17th, when we honor the memory of the Repose of the Holy Father, which took place in 1622. These two liturgical celebrations last three days each (23-26 August and 16-19 December). In previous years the slippers were also changed during Holy Week. The relic of the Saint is removed from the silver coffin which is to the right of the sanctuary (fig. 4-5) and placed vertically in front of his room twelve times total in the year, which is also a tradition followed by the other two sacred relics of the Ionian Islands, Saint Spyridon and Saint Gerasimos. These days are as follows: 17 December (three days), 25 December (one day), January 6 (one day), Good Friday (morning) until Pascha Monday (four days), 24 August (three days). Many faithful and visitors honor the Saint and bring with them as a vow a pair of slippers and a small apron made of the same material to cover a portion of the feet of the Saint that is kissed by believers (fig. 6). Then the faithful give the abbot the pair with the apron, which are kept in order of priority and are placed on the relic, due to the fact that the number of faithful that participate in this vow is great. When the time comes, after a reasonable time has passed, to remove the slippers, since the abbot had placed the slippers within, he seals one of the slippers and signs it at the bottom as a sign of authenticity and it is given back to the donors. This slipper is placed in a wooden gilded casket. The apron and slipper remaining is cut into small pieces and given to the faithful as gifts and blessings. During the period of this study it was observed that after a number of years (more than four years), there is a slight oxidation of the metal wires used for decorating the slippers due to the construction materials, treatment and possible volatile organic acids (VOCs) emitted in the interior wooden boxes (fig. 7). Dr. Christos C. Karydis is Assistant Professor (407/80) of Preventive Maintenance and the History of Textiles, Technological Educational Institute of Ionian Islands, Aristotle University of Thessaloniki.